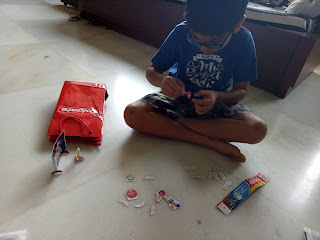 Pratham and I love doing Sunday activities where we have no rules. Imaginations which have no limit no logics. We like to get into a Fairyland and meet different types of characters. 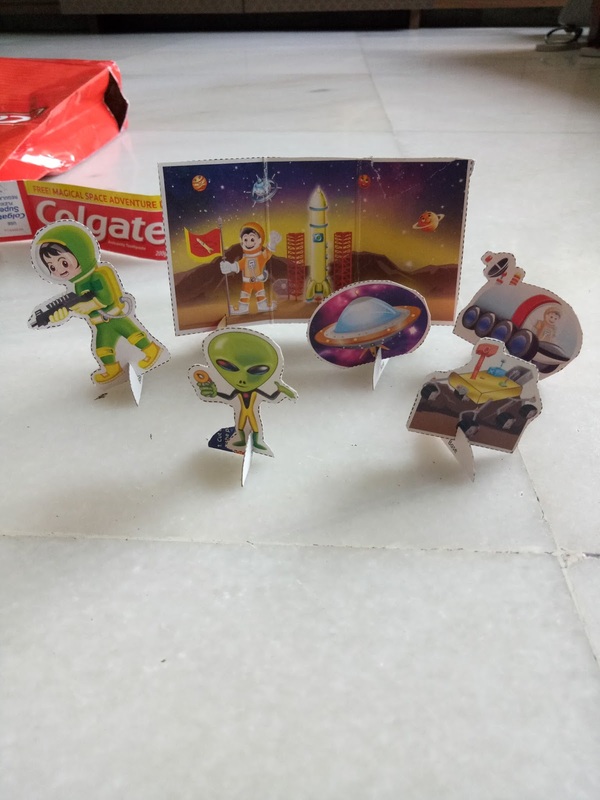 What else could have been better than taking up the #ColgateMagicalStories contest. 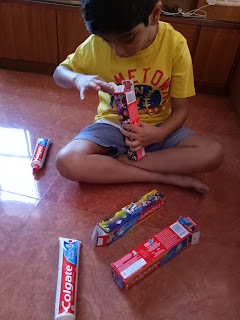 We unpacked the parcel that we received from Colgate and Pratham’s imagination had no boundaries. Below is his version of the story with his favourite Topic SPACE. Once upon a time, there lived two best friends named Tim and Noah. They loved exploring and experimenting adventurous activities. They enjoyed listening to NASA stories and their inventions. On their way Noah insisted that they visit Venus. Tim explained to him that they cannot land there as its the hottest planet and they will melt due to the heat on Venus. “ Look Noah! That planet is rotating in the opposite direction to the other planets. That’s Venus” exclaimed Tim as they saw from far. As they halted in Space, at first, they couldn’t balance themselves as there is no gravity. They started drifting away to a Red colour Planet. Noah and Tim at once said, “MARS” as they had learnt in school about Mars. Suddenly, they felt tremors. They rushed to their rocket and took off. They saw hot gush of volcano erupt. Just as they thought of relaxing, they saw a Giant planet Jupiter. Just after this planet they saw another planet which was spinning like a top. Before they could realise, the strong winds of the massive storm around the planet pushed them away. Noah and Tim felt giddy and landed themselves on hard surface which was made up of rocks, ice and dust. “We are on Saturn! And these hoopla hoop rings spinning horizontally are the rings around the Saturn” Tim excitedly jumped. The naughty Saturn bounced them to the next Planet Uranus. On their way they saw a flying object. “Thats UFO” exclaimed Tim. “Oh My God! My Ears are hurting. My ear drums will be damaged due to the loud sound made by the planet and the rings spinning around it vertically.” cried Tim. Its been days since they had seen their parents. They were missing their families and friends. As they landed on another planet, they felt very cold. The wind was as cold as ice. ” We are on Neptune” exclaimed Tim. They saw an Ice Palace. As they were about to enter it, they saw some different looking creature coming out. “ Tim, lets run back to our Rocket, they are Aliens” said scared Noah. Tim explained to her that Aliens are nice and kind. So they made friends with few of them and headed to return to Earth. “ Tim! Tim! Wake up. Its 7 O’clock. It’s time to go to school.” It was Tim’s mother waking him up to get ready for school. As he opened his eyes to the bright sunny morning, he thought to himself “ I missed visiting the hottest orange yellow ball of mass”. 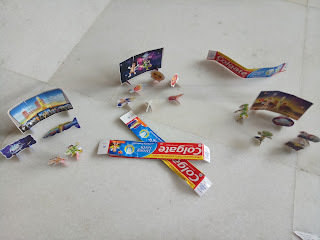 “I’m blogging my #ColgateMagicalstories at BlogAdda in association with Colgate." The much awaited festival of the year is around the corner. We all are busy with cleaning our houses and offices. Preparing for the coming festival season is so much fun. The kids too are excited about the festival. They are eager to get new clothes and gifts. They are thrilled to burst crackers too. 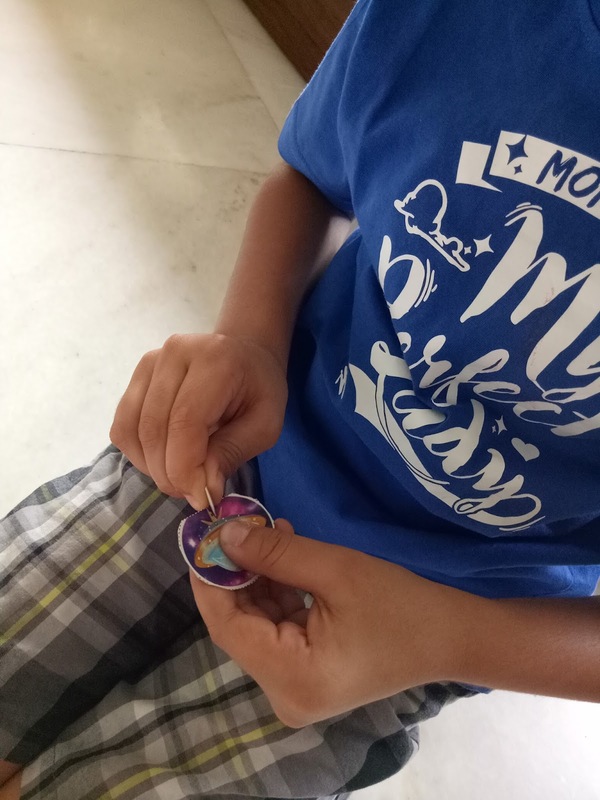 Being a parent, I have always believed that I must involve my son in most of the activities that are happening around. 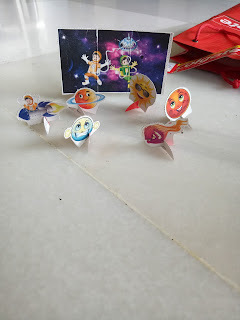 So this year I thought of involving him during his Diwali break. 1.Cleaning cupboard : This is one of the most important task in Diwali. It can get tedious but at the same time it can be made into a fun activity. So I asked him to arrange his clothes category wise. So he decided to segregate by keeping shirts together, T shirts, shorts, pants, undergarments, socks and his Indian wear. Then came to organise his accessories like belts, caps, watches and sunglasses. He enjoyed this process. I can confidently say that he has started to understand the concept of segregation and organisation. 2. 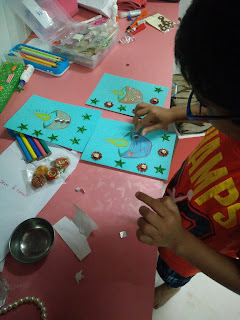 Card Making : Since he doesn't like to draw much, we have assembled sticking material to make Diwali cards for his friends and family. 3. Gifting : Most of the Indian families follow this custom of sending gifts to each other houses for Diwali. Involving him to wrap those gifts will be a fun activity too. 4. Cooking : The idea of cooking and serving something together will motivate and excite them to participate. So one of the evenings we made his favourite sandwich and he enjoyed every bite of it. 5. Rangoli : This is one thing which I look forward during Diwali. Pratham too has enjoyed watching me making Rangolis. This is time it will be Mother son Duo making one. Likewise there are many activities which we can involve our child to keep them engaged. Right use of their talent and creativeness will definitely help them in achieving their goals. The long school vacation is over and now most of us are back to the daily routine. 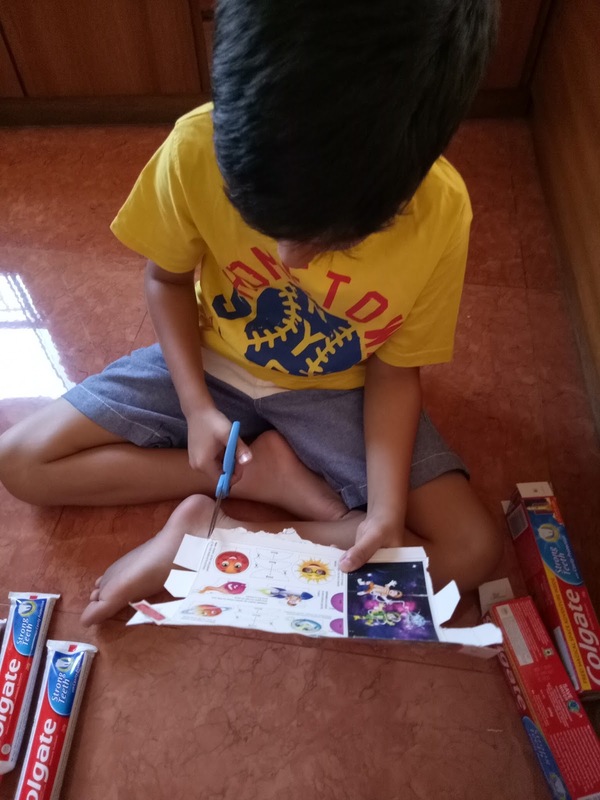 I was so waiting for the school to reopen so that Pratham can get back to his routine of school and I can get back to my routine.For 2 months I never had a routine. I was just around him all the time, trying to entertain him with activities, holiday planning, play dates and many more such things. It's now that I feel my vacation has begun where I can plan things for myself. I can make plans to meet my friends since Pratham is in school. At times, I do feel guilty that I'm a bad mom because I want "me" time. But then I think that's needed to think about ourselves as moms and also we get refreshed once we meet others. Even a simple task like cupboard cleaning or even arranging clothes need time. But when the child is around, moms can never think of doing it. Taking a 30 mins nap during odd hours of the day, feels rejuvenated. Ah! 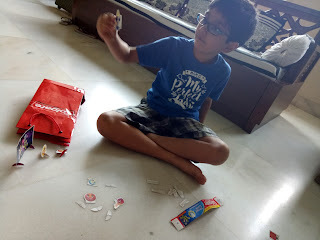 Pratham is back from school so I have to go and next blog will come soon.. In today's fast moving generation, it is so difficult to keep changing toddler's diapers again and again. Its getting hotter and humid day by day. So the child tends to get rash around his sensitive areas due to continuous wearing of diapers. The New Pampers Premium Pants is the right choice for my 4 years old nephew who faces the above mentioned problems. The long hours of absorbing nature of the diaper let's him play for hours without any irritation. The hypoallergenic lotion of aloe Vera keeps his skin safe and prevents rashes. The diapers are smooth like talcum powder that it doesn't feel he is wearing a diaper. And the most important is the snug like fit of The New Pampers Premium Pants that makes him and his mumma so comfortable as it doesn't leak the fluid. There are cute graphics on the pants which makes them different from regular diapers. The New Pampers Premium Pants are reasonably priced and easily available at most of the shops and chemists. They are also easily available online too. I was aware that a child can change your life but never knew this way. I have never been a sports person. I like to watch games but never followed any in particular. This could be because I never had a brother who would watch or follow sports. My dad followed tennis so I knew few rules of it but nothing more than that. So when I got married, I saw how someone could love a game. Yes, I am talking about my husband, Pranay following cricket. My father in law and my sister in law too loved the game. But he was at another level. The only thing I knew about cricket was Sachin Tendulkar and that also because of newspapers. Pranay watched all possible matches whether they were test matches, 1 day matches or series (thank God IPL didn't exist that time). He would watch any match 100th time but yet see it as if watching it for the first time. That was his LOVE for cricket. I never tried to understand this game and was amused at the fact 11 people running after a ball. So when I was blessed with a baby boy, I decided that cricket would never be given a preference. Today, my 5 years old breathes only cricket. He knows the names of most of the team captains with their bowling, batting and wicket keeping techniques. He also knows most of the players of each team (IPL and Nation teams). He made sure that I also learn and like cricket. Off side, leg side, no ball, wide ball, fours, sixes and Many more are the terms taught to me by my son, Pratham. He tells me who is batting, bowling and who will come next. He can recognize the players even if they wearing helmet. Today, I sit with him and watch most of the matches and also accompany him to stadium to watch matches (I have never accompanied Pranay). Pratham's favorite IPL team is Mumbai Indians and he loves to be called ROHIT SHARMA. Pratham's all friends watch cartoons on TV or on YouTube. 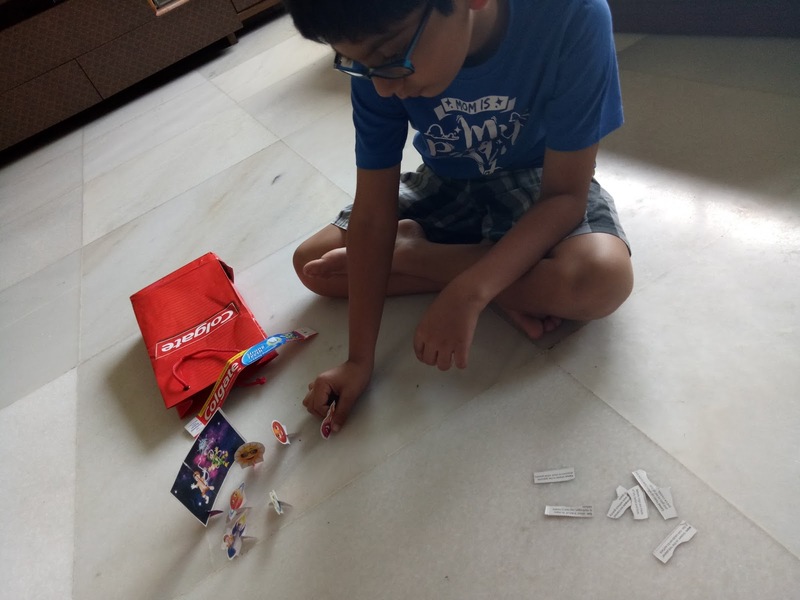 But pratham chooses to watch only cricket matches. I call him Cricket "addict". Yes, anyone reading this would be surprised to read this word but he is truelly loves this sport. People who knows us and him will also agree and understand why I am saying it. It makes me feel so proud when a Stanger comes and tells me " I know you are Pratham's mom and he truelly loves cricket".